This morning we went to a Farm Show at McFarland Ranch which is a living history museum located right here in Galt. The last time we were at McFarland Ranch was on Kite Day, several months ago. McFarland Ranch has been host to the Farm Show for the last few years but this is the first time that we have been to it. Participants came from different parts of northern California for the show. The Galt Lions Club, of which Doug and I are members, had a pancake breakfast and a hot dog lunch served at the venue. Doug helped out a bit and I kept an eye on my kids. Duncan wanted to get on every tractor he saw. He even managed to get on one, a small one fortunately. He was not supposed to get on any and a guy came up to us and told us as much. 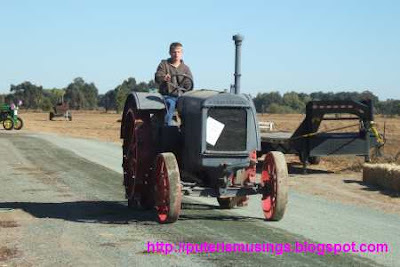 A teenager driving a tractor during the parade. We arrived at McFarland Ranch in time to see the tractor parade. It was interesting to watch the old tractors that have been restored and still running well. Two old tractors joining the parade. Besides the tractors there was quite a good display of old gasoline engines, or some such powered engines. Tractors and engines have quite the following and the owners showed them off as proudly as those who collect and restore old cars. 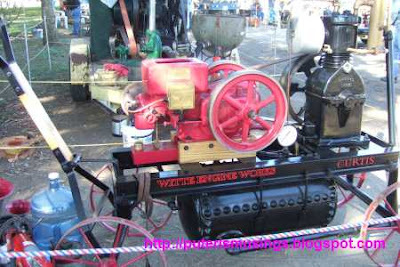 One of several gasoline powered engines on display at the Farm Show. I enjoyed the tractor pull. 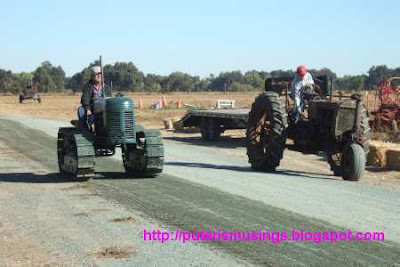 That was the first time I'd seen a tractor pull. 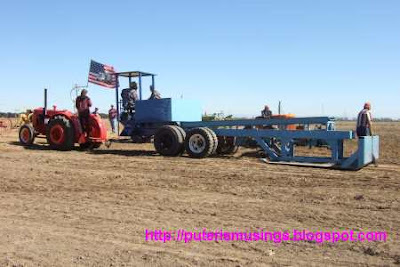 A 15-year-old kid who drove a tractor that was built in the 1940s pulled the load the furthest, over 100 feet. The blue thing is what the tractor had to pull. The weight that the tractor is pulling is the oblong blue thing next to the crew cab. That weight moves forward as the tractor pulls the whole thing forward. The weight can get too much that the front wheels of the tractors came up! 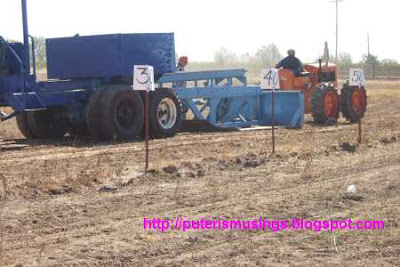 Here's tractor pulling the load, and I think this tractor didn't manage to pull the load beyond 85 feet. 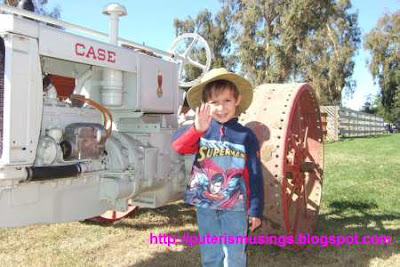 Duncan posing next to a beautifully restored tractor. Old engines, old tractors. Duncan had a good time. Denice just liked being there with Daddy, Mommy, and pancakes! There was a little Ferris wheel with Teddy Bears as passengers. Denice wanted me to get her one of the Teddy Bears and Duncan wanted to try and ride the wheel. Sorry kids, both were for display only.